Nurturing honeybees to produce beeswax and honey is called Beekeeping. An activity as old as Humanity, for prehistoric cave paintings show our (very) Ancients were already in the business. Anyway, the Bee was existing much before us : palaeontologists discovered fossils dated back over 40 million years ago. This special social insect has been fascinating since Antiquity and our knowledge of this animal - which represents the summit of sophistication for Invertebrates - is really progressing since our recent XXth Century (one of the most important discoveries was the precise meanings of Bees dances, due to the great scientist Karl Von Frisch - who awarded for it in 1973 the Nobel Prize of Physiology and Medicine, shared with the two other famous Animal Behaviour Specialists Konrad Lorenz and Nikolaas Tinbergen). Main bees productions are honey, wax, pollen, propolis and royal jelly. First of all, those untiring workers pollinate with no comparable efficiency flowering plants - which is specially important for crops and seeds : both quality and quantity of those directly depend on a correct previous fertilization (fruiting trees, strawberries, onions, buckwheat…). 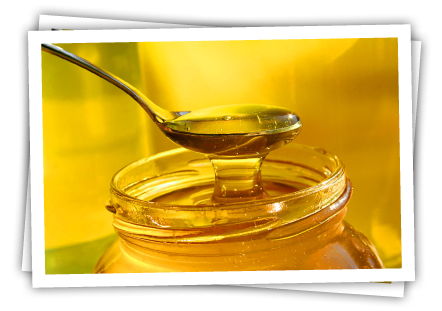 Honey is the most well known Hive product (clay tablets from Mesopotamia already referred to it as a medical drug about 4 700 years ago). The sweet substance stored inside the hive by the bees is simultaneously a top energetic feed very appreciated by sportsmen (310 calories for 100 grams), a booster for haemoglobin ratio in blood and calcium or magnesium retention, and also such an efficient scaring substance that a growing number of hospitals are using purified versions of it for Surgery. Did not Aristote recommend (4 centuries BC) application of white honey to calm an inflamed eye - like Indians name it "the drug for ill eye" ? - Wax (produced by wax glands of the Bee Worker when it is between 5 and 20 days old) gives a natural wood treatment (far better than industrial copies) with a nice glossy effect, limitation of fingers traces and a pleasant perfume (which moves away… insects !). Obviously, candles have been manufactured too with bees wax for centuries. Very complex mixing of organic components counting with more than 300 identified elements, wax meets numerous modern applications in cosmetics and pharmacology (lipsticks, creams…). - Pollen (single origin of essential proteins for the bees) provides a powerful alimentary complement to Humans. With a versatile composition depending on the areas and foraged flowers, it is as rich in glucides (mainly glucose and fructose) as proteins - both elements represent 50% of its weight - and contains an amazing amount of very beneficial components for the Health : Amino acids, mineral salts (potassium, calcium, magnesium, phosphorus, iron… including selenium, a very rare antioxidant), a lot of Vitamins (A, B2, B3, B5, B6… D, E, H, Folic acid, etc…). In a few words : 100 gr. of pollen will feed you as much as 500 gr. of beef or 7 eggs ! - Royal jelly (specific food for the Queen) is the most elaborated product of the hive and the key for the whole colony sane growth. It is an extraordinary food - kind of predigested pollen - almost lipids free and extremely rich in proteins, where you mainly meet Amino acids, Vitamins (specially Panthotenic acid - B5 -) and multiple trace elements (for example, acetylcholine, a bactericid and fungicid substance). In 5 days, and thanks to Royal jelly, larvae multiply their weight by… 1 800 (unique case, in the whole animal World). This natural and ultra-powerful stimulus is recommended by medics to improve (sometimes in a spectacular way) our biological resistance, giving back energy and good mood (recognized euphoric effects) to old people, teenagers and top sportsmen (fast recovery after physical or nervous tiredness). The Royal jelly just has one defect : its fragility and weak production ask the beekeeper a great know-how and a lot of work. - Honey Bee Venom (secreted by all the Worker bees) scares Humans almost likely snakes bites. But, as many poisons, this substance (whose all properties are still not known) has amazing medicinal virtues : King Charlemagne or Ivan-the-Terrific used it yet to relieve their rheumatism and gout crisis. Proof of its anti-inflammatory efficiency : it will cost you to meet one beekeeper suffering from rheumatism. Today, Honey Bee Venom stays as the most effective substance against arthritis - whatever it is acute, chronic, from traumatic or organic origin (gout). Even better : with its 2% of Apamine, an alkaline pepside with capacity to act on the nervous system, It is highly recommendable against auto-immune diseases - such as the sadly well known multiple sclerosis : today, no other treatment is able to offer its neurotropic virtues and the number of patients testifying about their spectacular recovery thanks to this very specific Venom has been promoting a special focus of interest from Medics Worldwide those last years.